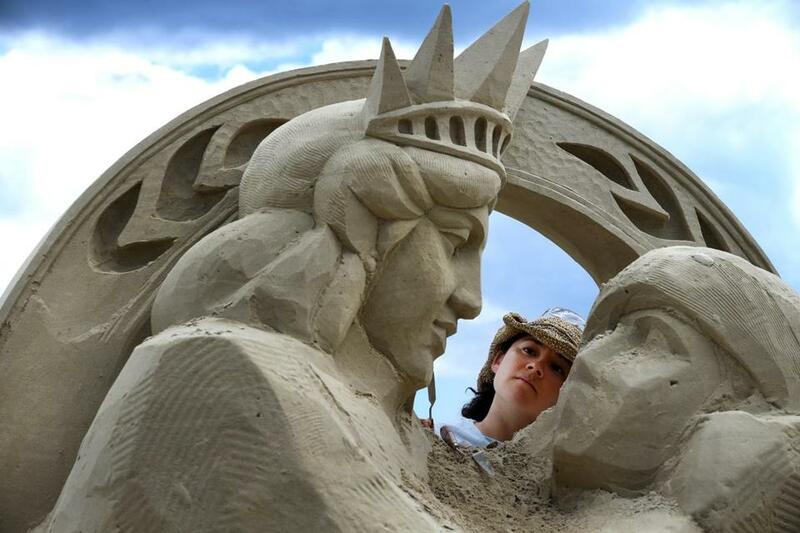 Master artists will compete July 22-24 in the Revere Beach International Sand Sculpting Festival. ART FROM THE BEACH Artists from near and far will present their creations at the 2016 Revere Beach International Sand Sculpting Festival Friday through Sunday, July 22-24. This year’s theme is science, technology, and innovation. Master sand sculptors compete in solo and duo categories. The event attracts more than 900,000 spectators from across the country. Local participants include Deborah Barrett-Cutulle of Saugus. Other competitors come from Canada, Mexico, Australia, Italy, the Netherlands, and beyond. The event is sponsored by the Revere Beach Partnership, which supports what is considered to be America’s first public beach, established in 1896. The festival features food trucks, live entertainment, children’s sand sculpting lessons, and fireworks. Events run 10 a.m. to 10 p.m. Friday and Saturday, July 22-23, and 10 a.m. to 8 p.m. Sunday, July 24. The sand-sculpting event is open to the public and free. Visit reverebeachpartnership.com. ANIMAL OLYMPICS The Stone Zoo is getting into the spirit of the upcoming Summer Games with Animalympics on Saturday, July 23. “From leaping to swimming to jumping, animals are capable of incredible athletic skills,” said Patrick Cusick, a spokesman for the zoo. “Guests can learn more about these abilities and find out how they compare. The event runs 10 a.m. to 2:30 p.m. at the zoo, 149 Pond St. Stoneham. Admission is $16.95; $14:95 for senior citizens; $11:95 for ages 2 to 12; free ages 2 and younger. Call 617-541-5466 or visit zoonewengland.org/stone-zoo. HOME ON THE COAST “Summer Drift,” an exhibit featuring oil paintings by Sara Egan and Frances Hamilton and sculpture and drawings by Kyle Browne, is at Flatrocks Gallery in Gloucester through Aug. 14. Egan is known for her public, large-scale multimedia abstract installations throughout Boston. This exhibit features her recent smaller oil paintings, inspired by her home in the Annisquam section of Gloucester. Hamilton’s paintings and collage have been exhibited throughout New England for more than 25 years and are held in private and corporate collections. This exhibit includes paintings of the old Brynmere Hotel in Annisquam and a cabin on Squam Lake, as well as her playful Toy Boat monotype series. Browne returns to Flatrocks with new work from her ongoing exploration of the “consciousness of place.” An environmental artist, she creates site-specific sculptures and graphite drawings using natural material. The exhibit includes a series of boats made from cork tree needles from the Arnold Arboretum in Boston. Flatrocks Gallery is at 77 Langsford St. Call 978-879-4683 or visit flatrocksgallery.com. .
PICTURE THIS A celebration of the season, “Frozen Pops + Flip Flops,” is at Zephyr Gallery in Salem throughout July. The first photography show at the contemporary art gallery features the work of Jeff Dykes, Constance Festo Lafond, Peter Grimshaw, Christine Michelini, and Katherine Richmond. Dykes studied photography at Salem State University and worked as the staff photographer at the Peabody Essex Museum. He has a photography studio in Salem. Lafond is a multimedia artist with a studio in Beverly. Grimshaw, of Peabody, has taught art and works in Salem. Michelini works and lives in Salem and is cochairwoman of the city’s Cultural Council. Katherine Richmond is from Gloucester. Zephyr Gallery is at 37 Turner St. Call 978-594-8935 or visit zephyrartgallery.com. SHARING HIS VIEW “My Impression of New England and Beyond,” an exhibit of cityscapes, ocean views, and reflections by artist and architect Abram Shkolnik, is at the Abbot Public Library in Marblehead through July 28. A public reception is 2 to 4 p.m. Saturday, July 23. Shkolnik was born and raised in Ukraine. He began painting and drawing at an early age and went on to become an architect in Moscow. Shkolnik moved to Boston in 2000 and has since been painting scenes from Boston, Cape Cod, New Hampshire, and Maine. The Abbot Public Library is at 235 Pleasant St. Call 781-631-1481 or visit abbotlibrary.org .